Prequel to the Legendary Bastards of the Crown Series. Lady Annalyse Granville is a cursed second-born twin. Because of superstition and fear that a second-born twin is naught but a spawn of the devil, she’s been sent to live with the nuns. However, she returns to her father’s castle at Christmastime at her sister’s request. Her sister is the king’s mistress and very pregnant with his baby. And what happens during Annalyse’s visit changes her life forever. Ross Douglas has managed to get betrothed to an English lassie, having alternative motives in his head because of his hatred for the English king. But when he spies an innocent maiden standing under the kissing bough, he knows he has to kiss her. Can one kiss change a man’s life? What happens that Christmas changes everyone’s lives in ways they could never expect. Be sure to read Restless Sea Lord – Book 1 of the Legendary Bastards of the Crown Series that follows this book. Destiny’s Kiss: Prequel to the series by Elizabeth Rose is an intriguing insight into the , “Legendary Bastards of the Crown” series. Ross of Clan Douglas, a Scotsman, whose hatred for the English King sends him on a quest for revenge. Lady Annalyse Granville, is the cursed second twin, herself. When her sister has triplets she can only imagine what will happen to two of the twins. The first twin is the only one their father wishes to kept. What’s a sister to do? This is Annalyse and Ross’ story and what an interesting tale, to be sure! Ms. Rose uses myths, legends, superstitions and romance, to bring readers a satisfying and intriguing story. While, a quick read, Ms. Rose manages to bring this story, and the characters to life through the pages of “Destiny’s Kiss”. A magical romance, to me, and it gives readers a wonderful introduction into Elizabeth Rose’s, “Legendary Bastards of the Crown” series, which promises to be an awesome series. Fans of historical romance, superstitions, myths, and quick reads, will surely enjoy “Destiny’s Kiss”. A satisfying and enjoyable read! Strongly recommended! Source : Received for an honest review from the author. However, all opinions, insights and thoughts are my own. Vikings evoke images of strong men who allow nothing to stand in their way. They’re not normally associated with tender feelings. Wildflowers conjure more personal and sentimental images. In BANISHED, a handful of bluebells picked from a meadow by childhood sweethearts becomes a symbol and eventually an acknowledgement of a love long denied. Audra longs to leave behind the life of an elite mercenary, a role forced on her after her father’s banishment from the Viking brotherhood. A journey from exile to the court of King Canute offers a new life, though she fears few men will want her once her history is known. The bloody feud that precipitated her father’s banishment resurfaces when she is unexpectedly reunited with a childhood sweetheart. Sigmar has always held her heart, but he is the son of her father’s enemy. Sigmar’s hopes for advancement in Canute’s service will be dashed if he obeys the dictates of family honor. Can Audra and Sigmar lay the hatreds of the past to rest, or will the Viking code of vengeance triumph? Banished by Anna Markland is a fantastic Medieval Viking Historical Romance set in 1017 England. A novella, and a quick read, only about 156 pages, but packed full of deliciousness. Steady paced with a cast of characters that will steal your heart as you feel their struggles, challenges and destiny come to fruition. Filled with the pride of Vikings and so much more. Such as family feud, vengeance, destiny, love, honor, soul mates, family roots, the power of love to willingly face any obstacle with pride and honor. This is the story of Audra and Sigmar, two childhood friends, whose father’s became bitter enemies, resulting in a feud and banishment, that torn them apart….Years later, Audra and Sigmar meet again, the rest as they said is history or a tanalizling story. ..
Women Viking Warriors, Jomsviking Brotherhood, assassins, and an elite team of twelve, (known as Dodeka)who become the newly crowned King Canute’s personal assassins/bodyguards. Packed full of history, and a frightening tract across the legendary Dartmoor, makes, “Banished”, a captivating and mesmerizing novella. A bit of mystery and intrigue add a touch of excitement that’s simply breathtaking. Of course, passion and romance is included. In “Banished”, Ms. Markland lends her special storytelling to enable the reader a glimpse into the inner workings of a new King, his elite assassins, and the power to overcome any obstacle for love, with honor and the Viking pride. Intense and powerful! A must read for any Medieval fans, fans of Viking Romance and readers who enjoy reading about, destiny and the power of soul mates to overcome obstacles. Strongly recommended for an afternoon read! Received for an honest review. However, all opinions, insights and thoughts are my own personal opinions. What an absolute pleasure to read! HAPPY RELEASE DAY, KRIS KENNEDY! ! 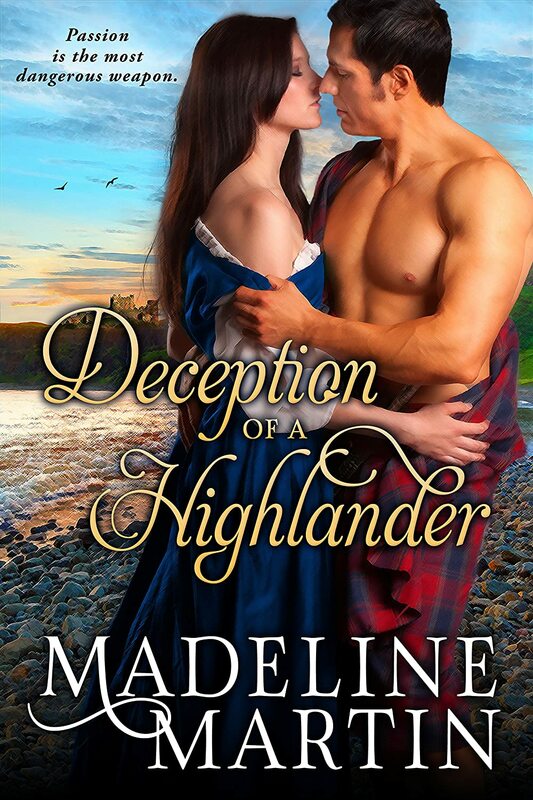 DECEPTION OF A HIGHLANDER by Madeline Martin is an exciting Scottish Medieval Historical Romance set in 1604 England.#1 in the new “Highlander” series and what a beginning! Fast paced, action packed thrill ride of an Medieval Romance. Filled with intrigue, danger, betrayal, a female assassin, suspense, passion and Romance. I loved this tale! Well written with charismatic characters who will capture your heart and hold the reader in awe. Well written with vivid descriptions. The reader can almost smell the heather, and feel the tension pouring off the pages. An awesome story by a new author and one I look forward to reading again. A must read! Fans of Scottish Highlanders, Historical Romance, England, Scotland, and beautifully written tales will definitely love “Deception of A Highlander”. I absolutely loved this tale and would highly recommend. Border lord Walter Scott of Rankilburn, grief-stricken after burying his father, goes to the forest seeking solace. Instead he finds a half-naked young lady fleeing pursuit. Wat offers his protection, but honor demands that he return the golden-eyed beauty to her rightful husband-even though the last thing he wants is to see her in another man’s arms. THE MOONLIGHT RAIDER by Amanda Scott is another exciting Medieval Historical Romance set on the Scottish Border in 1426. #1 in the new and exciting “Border Nights”. What a beginning! Fast paced and filled with adventure and romance. I love this author’s tales of Scottish Lowlanders, romance, adventure danger and love. This was no exception. Ms. Scott is a true storyteller, leaving the reader in awe as well as intrigued. From the very first page to the last you will be intrigued. Filled with danger, the fascination of the Scottish Lowlands, family, the clan, King and Scotland. Ms. Scott creates an atmosphere of shear Scotland, so much so, the reader can almost feel the power of the Scottish threat. I loved to see how Walter Scott of Rankilburn,Laird, and Molly Cockburn,runaway bride of a brute come together to figure out their attraction to each other. While, Wat is determined to protect Molly from her family and her not so much husband, trouble is brewing. Can he save both his clan, help his King, and save Molly? You must read “Moonlight Raider” to find the answers to this exciting tale of romance and love. Ms. Scott is an absolute delight to read and an amazing storyteller. I can hardly wait to read the next installment. Well done!Highly recommend to any and all Scottish Historical Fans.